There’s nothing I love more than a huge fruit salad on a hot summer day. There’s nothing I love more than a huge fruit salad on any day when someone else washes, cuts and makes that delicious fruit salad. In reality though, the person making it is typically me, so there are days when a little short cut just makes my day. That is the case with this Sunshine Fruit Salad when a tiny surprise ingredient takes this from simple to splendid and rich enough that it can serve as a dessert as well. Those are my kinds of recipes. This one is especially perfect for large groups because it uses a few quick cans of fruit. We gobbled a huge bowl up just this past week. 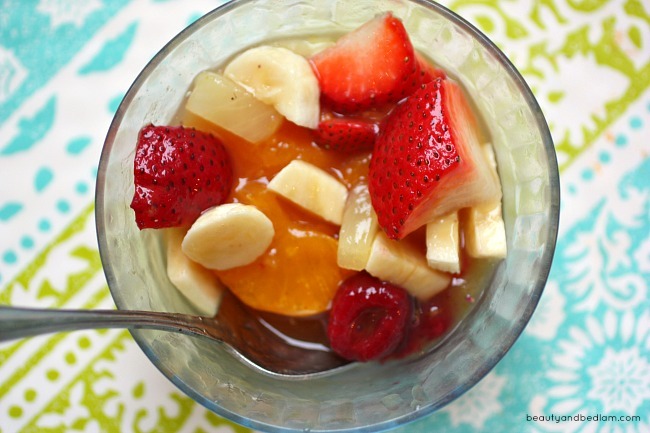 Summary: This delicious fruit salad brings together some of our favorites with a new twist. Please know that you can mix and match any of these fruits in the quantities you desire and it will be delicious. This is just to give you a basic, core recipe. Drain oranges and pineapples, reserving the extra liquid. 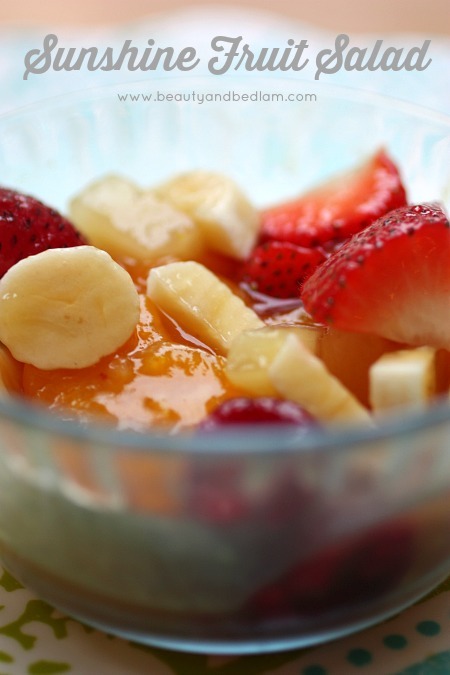 In a big bowl, combine dry pudding mix with reserved fruit juice. Mix well. Fold in oranges, pineapples and strawberries. Chill for at least 1 – 2 hours. Right before serving, add in bananas.